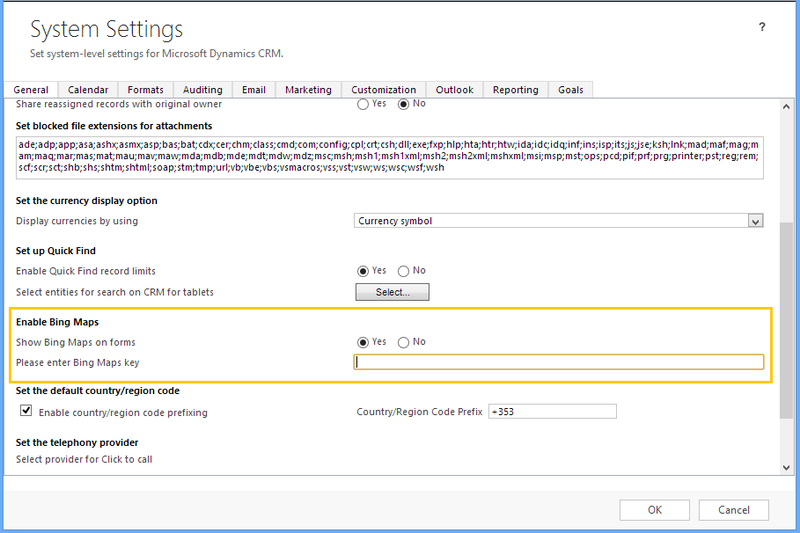 In the December 2012 Update, mapping integration was provided with CRM. For this feature to be used for On Premise requires a few basic steps to be accomplished which help in enabling the Bing Maps. So essentially, the Bing Maps requires a developer key for the API’s to work. To provide this key there is a section ‘Enable Bing Maps’ in the System Settings Page. Simply navigate to Settings -> Administration and then click on System Settings. Scroll down on the General tab and you will see a section named ‘Enable Bing Maps on Forms’. a.) A Radio button which determines whether to show the Bing Maps on forms or not. b.) A textbox which acts as the placeholder to capture the Bing Maps API Key. 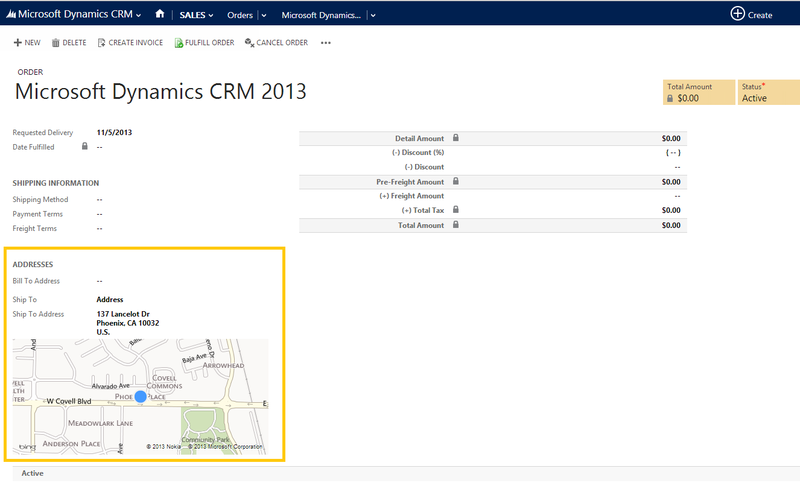 Bing Maps was introduced in December 2012 Update for Microsoft Dynamics CRM, this feature helps in getting a quick view into the location of their customers from process-driven forms. The map also has other functionalities like click and drag to a particular location, Zoom in and out using the scroll-wheel of your mouse, Single clicking the map to open up the Bing Website to display selected location in another window. However one limitation was that it was available only on the Account / Contact and Lead forms, with CRM 2013 we are extended it to be placed on other entities as well (Quote / Order / Invoice / Competitor and System User). Also we now have opened it up for customization which enables one to add or remove the Bing maps, along with that one can also position the control anywhere needed on to the form and also bind it to any of the available address fields for that entity. For entities that have been updated to the new user experience, the updated entity forms which have an Address field will have a button to add the Bing Map to the form in the Ribbon of the Form editor. 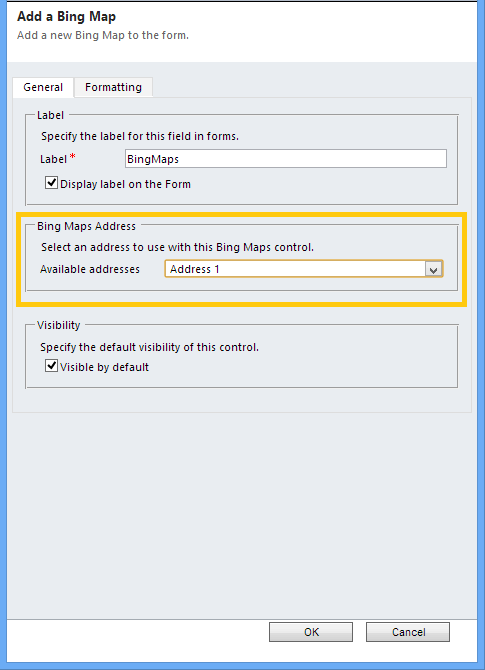 Clicking on it will open a dialog, which will list the Bing Map Control properties. The user can enter the Label to be displayed and along with it there is also an option set which lists all the possible addresses that the Bing Map can use to plot for that entity. Address1 is selected as the default option. As seen below we have the Order entity for which there are the BillTo and ShipTo addresses and by adding the Bing Maps to that entity which is now possible with the help of customization, it is now possible to plot any of those addresses.